In the Studio with Joyce Piven: Theatre Games, Story Theatre, and Scene Study is a guidebook that takes you directly inside the creative process of the renowned Piven Theatre Workshop led by Joyce and Byrne Piven. The Piven Workshop in Chicago has nurtured theatre artists celebrated in the U.S., Ireland, and Britain including John Cusack, Joan Cusack, Jeremy Piven, Shira Piven, Aidan Quinn, Sarah Ruhl, Lili Taylor, and Kate Walsh. 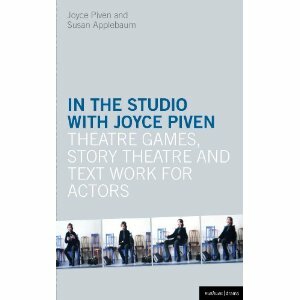 Co-authors Joyce Piven and Susan Applebaum describe the Workshop techniques (developed and refined over forty years of theatrical training) as a virtual fly-on-the-wall experience, taking the reader inside the director’s studio, classroom and green room. which is a treasure trove of material for teachers and students alike.